Overall Bow: 5" X 3" X 1"
Grosgrain ribbon: 2.25", 1.5" & 3/8"
Towel : 30" X 60"
Rock On Guitar Stars! This is a matching set of a grosgrain bow and an applique guitar on a colored bath towel. 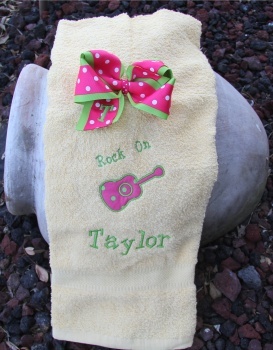 This is a yellow bath sized towel that has a hot pink and lime green material with polka dots that is in the guitar. The words "Rock On" are written on an angle above the guitar. The grosgrain bow is double layered. The bottom is a lime green 2.25" and a hot pink with white polka dots 1.5" wide is on top. Add 2 lines of embroidery to get it pictured above with a one inch initial on the bow and a name on the towel. Rock ON with this rocking set!